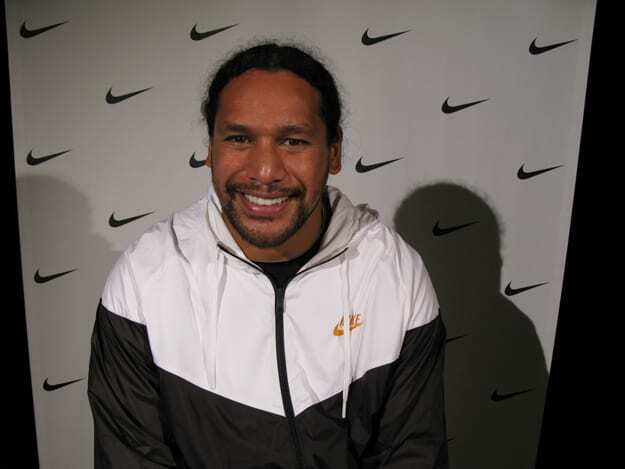 We recently got a chance to sit with professional football player Troy Polamalu to help celebrate the launch of Nike's Air Trainer 1. While that guy can kill anyone on the field, he is one of the coolest, most centered people in professional sports. Complex: You seem like a very centered and focused person. How do you keep it together after two championships? Complex: What are your pre-game rituals before a game? Troy Polamalu: It differs from day to day. Some days I&apos;m just flipping through the iPod trying to get pumped, some days I don&apos;t want to listen to anything and just focus. From game to game from day to day, whatever people do to motivate themselves, they do. I do all kinds of things. Complex: What&apos;s on your iPod when you&apos;re flipping through it? Complex: If you could play any other sport besides football, what would it be? Troy Polamalu: Yeah, I really enjoy surfing a lot. It&apos;s an awesome sport. With surfing there are no mind games versus Peyton Manning, or versus anyone else. It&apos;s not me trying to throw a certain shot put further —or to put a ball in a hoop, it&apos;s just me against mother nature. If mother nature throws a 20 foot wave your way, are you going to have the guts to paddle for it and drop in? Or not? Complex: How long have you surfed for? Troy Polamalu: I&apos;ve been surfing for a couple years, in the offseason, here, in California and in Hawaii. I&apos;m not very good, but it&apos;s just something that to be out there in the water, no cell phone, no music... very few sports are as pure as that. Complex: Does it apply to your career professionally? Troy Polamalu: I think it&apos;s important to cross train. Surfing is a good cross training sport for your shoulders. I don&apos;t think I know of any other football player who does it, who can go and paddle out past the sets. It is such a crazy shoulder workout and so tiring, nevermind standing up. So the cross training is one side, but there are very few sports where you can find that tranquility. Some people find that in golf, but when you&apos;re in the water it&apos;s such a difference from the golf course or the basketball court. That&apos;s what makes surfing unique over any other sport. Complex: Can you tell us a little about your barefoot training regimen? Troy Polamalu: If your feet are strong, the rest of your body doesn&apos;t have to compensate. I train with a gentleman by the name of Mark Marinovich, and his training philosophy centers around creating an environment that is more correlated to athletic movement. People aren&apos;t going to bench slowly on the field, they&apos;re not going to squat a perfect 45 degrees when you&apos;re in the middle of the play. We train in a way that works the nervous system and the body to react in an athletic motion. The barefoot component of my training is about strengthening the toes. Mark compares it to a dog on a hard floor vs a cat on a carpet, having your toes strong and your nervous system trained. Complex: What specifically do you do? Troy Polamalu: I work barefooted on balance plates. I do explosive squats on balance surfaces that your body has to use muscles it&apos;s not used to. It&apos;s all kinds of exercises that your body isn&apos;t really used to, and it tricks your body into getting stronger every time. Complex: Are there any sports that you watch when you&apos;re not focused on football? Troy Polamalu: MMA. I really enjoy the individual sports. With great fighters, it&apos;s not just what&apos;s God given. Lebron, James? There&apos;s a lot of God-given talent there. In MMA, the fighters are raised into it. You&apos;ve got 6-foot guys, you&apos;ve got short heavy guys. Fighters are raised into MMA. It&apos;s more about what&apos;s internal, not what&apos;s God given. When you have a great fighter like Rickson Gracie or Fedor Emelianenko-they&apos;re greater than the others because they have an internal spiritual being that separates them from the rest in their craft. They have the warrior spirit. Complex: Do you see yourself as a guy with god-given talent, or are you someone with internally driven spirit? Troy Polamalu: God has control over everything, and obviously, everything to everyone is god-given. Some of us might not understand why LeBron James is the way he is, but fortunately he found his great craft in life. For me, I don&apos;t know. I try to take what&apos;s given to me and then mold it to be a better football player. Complex: Besides on the playing field, you&apos;re also incredibly focused and low key off of the field. Do you have any other creative pursuits? Are you working with Nike on any special projects? Troy Polamalu: Well, there is the Trainer 1 program, and there is a shoe specifically for me. Nike is just a plus to everything, Coke is a plus to everything. All the product stuff is not so much my thing. My craft is football. And that&apos;s what it&apos;s about. It&apos;s about your sport, it&apos;s about training for your sport. Complex: Referencing the Trainer 1 program (which launches this summer), are there any other major advances that have made your job easier in any way? Product lightness, support, protection? Troy Polamalu: It&apos;s tough to judge, because it&apos;s always a level playing field. I&apos;m not going to be the only guy wearing great shoes next year. Everyone finds great shoes, what&apos;s comfortable for them, so everything is a level playing field. Whether it makes for a healthy career? Yeah sure technology is great for having a healthier career. Complex: How do you keep that hair like that? (Pause)? Troy Polamalu: [Laughs.] I condition it every other day, I comb conditioner through my hair. I also shampoo quite a bit. It&apos;s important for me to have strong hair in case someone pulls it and tries to rip it all out.